Attendance was down at this year's spring COMDEX trade show in Atlanta; only 55,000 people attended the show! Shaking hands with each of them and listening to their sales plans, marketing information and technical wizardry took much of the week. The show ran for four days in May and included over 1,200 booths at the Atlanta convention center, spilling over to the Apparel Mart next door. Atari attended the show with its usual bag of tricks. Packed into the Atari booth were more than 20 independent manufacturers of software and hardware applications for the ST. ST-Log went to the show to put its finger on the pulse of the ST market, and we found it to be alive and well. Atari announced that a new division has been established called "Atari Computers." In an age where you can buy an Atari calculator in a grocery store or buy a 7600 cartridge-based game machine at a toy store, Atari Computers is a newly founded division to market Atari's home and business computers in the U.S. market. 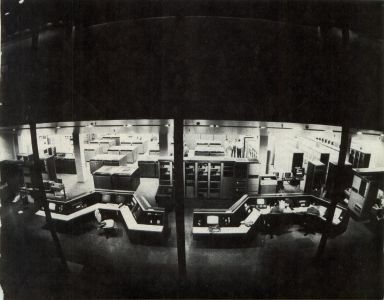 At the time this article was written, days after COMDEX, the new Atari Computers division was headed by Chuck Babbit, president, Tony Gould, VP sales and Neil Harris, marketing. However somewhere in those busy weeks between this show and the Summer Consumer Electronics Show, Atari found it in their infinite wisdom to do away with Mr. Babbit and Mr. Gould. 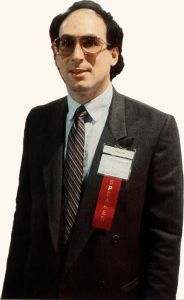 Harris was formerly the director of corporate communications for Atari Corp., which made him the mouthpiece through which the company communicated both rumors and facts about news and information pertaining to Atari computers. Harris has now changed his title to director of product marketing. Speaking at a panel discussion on Niche Marketing at COMDEX, Harris told the small but interested audience that "Atari's roots were firmly placed in games, even before the Tramiels took over the company." 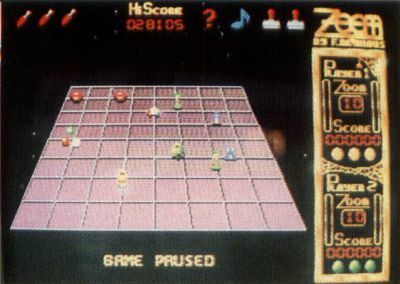 Harris said the domestic slump in Atari computer sales has partly been due to slow product releases and to the lack of a game plan to revamp the dealer channel for home computers. The new Atari Computer's first marketing push was into the desktop-publishing market. At the show Atari demonstrated its desktop-publishing system using a Mega 4, monochrome monitor, SLM804 laser printer, 20-megabyte hard disk and Publishing Partner Professional (Soft-Logik). The total package price for this setup is $5,492. This is a savings of up to $2,000 over the equivalent setup using a Macintosh SE or a PC Clone and equivalent software. Although there are some technical details which might make a Mac or PC Clone better suited for your application, Atari makes a very strong point for using its laser printer: The Atari laser printer is fast! One page of graphics can be printed in under 30 seconds, while the same page using a Postscript laser printer might take up to 20 minutes to print. 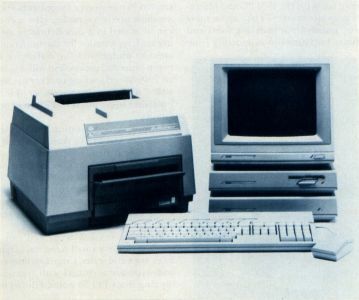 The Atari laser printer is speedy because the communications interface between the printer and an ST doesn't rely on a local area network like the Macintosh, and the images to be printed are developed inside the ST, which has a quick CPU compared to most laser printers. Another strong point for the ST is its use of standard connectors. Just about every printer and modem has a jack for a DB25 connector, so connecting them to the ST is a simple process. The Apple Macintosh uses its own mini-network system to communicate with a printer, which makes it necessary to buy expensive Apple equipment and slow because of network communication protocols. Everyone demonstrating products in the Atari booth was equipped with a Mega 4, SLM804 laser printer and the new Mega-compatible 20-megabyte hard disk, which fits neatly under the Mega's square box. Rumors of some software not working with the Mega because of the new operating system ROMs seem to be fading into the sunset, because everyone at COMDEX was running with a Mega 4. Atari has in past trade shows found a tangible benefit in hosting third-party vendors in their booth. In addition to making the booth seem more crowded with interested people, the vendors are themselves some of the best salesmen for Atari. This show had minibooths set up within the Atari booth for approximately 20 vendors to show their interesting wares, both soft and hard! It's no great surprise to find some of the more interesting hardware developments coming from West Germany, Atari's favorite playground. At the Atari booth, ISD Marketing, the company that brought VIP Professional (a Lotus 1-2-3 clone) to the ST, was showing a new desktop-publishing system running on a Moniterm large-screen monitor. The Moniterm Viking 1 monitor gives you 1,280 by 960 dots of resolution. Imagine having a desktop twice the size of your current ST GEM Desktop. Instead of having to view only a little part of a page, you can use a desktop-publishing package to edit an entire magazine layout. Moniterm Corporation is a leading supplier of high-resolution monitors for the computer industry. It began by developing custom high-resolution monitors for space research, typesetting equipment and medical screening applications, and in 1986, it entered the personal-computer market with large-screen products for the IBM PC and Macintosh computers. Moniterm's high-resolution monitors are in themselves small computers, as they intercept the commands that the IBM PC or Macintosh computer use to display text and graphics on their normally small video screens. When you buy a Moniterm monitor, a controller card is included that plugs into your computer. A group of engineers in West Germany developed the Matrix controller for use with the Atari ST computer. The Matrix card works with any GEM-based software product, and the combination of a Viking 1 monitor and Matrix card is being sold for DM 5,000 (deutsche marks), approximately $2,500. ISD Marketing was the first company to show this unique combination of equipment in the U.S. They expect to be selling the Viking 1 ($2,395 list) monitor, Matrix card and their new high-end desktop-publishing system Calamus ($449 list) for approximately $3,000, although exact prices were not known at the time of this writing. If you don't want to plunk down a big chunk of money, fear not. 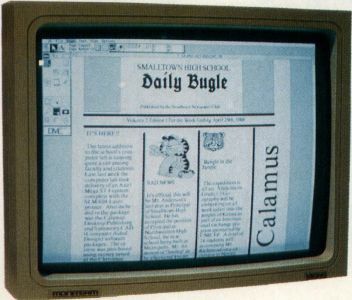 ISD's new desktop-publishing system, Calamus, also works on a standard Mega ST with a monochrome monitor. Calamus is a big system. The program combines the best features of a word processor, page-layout program, graphics-illustration utility and layout-design system. Calamus can import graphics from scanners, digitizers and word-processor files. Just about everything is icon-driven so most functions are intuitive. Finished documents can be printed on any Epson dot-matrix printer or Page Description Language (PDL) printer (e.g., Postscript, DDL, Interpress, Linotype typesetters and encapsulated Postscript files). ISD is currently negotiating with Bit-stream for the license of several fonts for Calamus. Bitstream Inc. is a leading supplier of fonts for the IBM PC and Macintosh graphics market. They make their money mostly from licensing fonts and software for Postscript supporting companies. Calamus will have a hefty list price of $449, and ISD is marketing it for the high-end desktop-publishing user who needs a package saturated with functions and special controls. ISD expects to have a scaled-down version available for 1040 ST systems at $199.95 later this year. 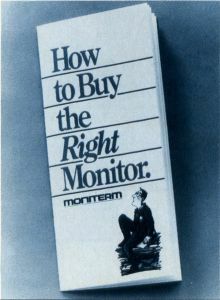 If you are interested in the Moniterm monitor in general, Moniterm publishes a small booklet titled How to Buy the Right Monitor. The booklet is filled with information about high-resolution monitors. They will send you a copy at no charge. Their address can be found at the end of this article. Calamus is designed for the high-end desktop-publishing (DTP) system market. Soft-Logik and Timeworks seem to be aiming at the low-end DTP users. Both companies have new products that are soon to be released for the ST.
Publishing Partner Professional ($199.95 list) is SoftLogik's next generation of ST publishing systems, though the former Publishing Partner program will continue to be marketed at a lower price of $79.95. Users can upgrade for a nominal fee, if they later choose to do so. Publishing Partner Professional (PPP) supports variable zoom ratios; so you can zoom in on any area of a page easily using the mouse. It loads pictures in GEM image-file format, so any pictures from Easy Draw, Degas Elite and other scanned images may be incorporated. Text can be rotated in one-degree increments to create some pretty interesting effects. Font's can be scaled to a user-definable measure making it easier for the nongraphic artist to understand the difference between picas and inches. You will also find an 80,000-word spelling checker has been added and new Tag-Sheets so Ventura Publisher users will find PPP to be very familiar. SoftLogik is expanding into the Amiga market as well. An Amiga version of PPP will be available during summer '88. 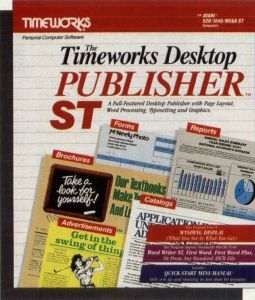 Timeworks has announced its new Desktop Publisher ST ($129.95 list). Publisher is a full-featured desktop-publishing system with an integrated Word Processor, Page Layout Program and Typesetting system. Publisher is GEM-based and easy to use. It includes a small selection of type-faces, sizes and styles. Large headline and body-type are included with typessizes ranging from 7 to 96 point. Editing features include auto-hyphenation, master pages, style sheets, paragraph tagging and keyboard macros. Graphics from DEGAS, Neochrome, Easy Draw and GEM image files can be imported. You can import text from Word Writer, First Word, and First Word Plus. Output can be sent to a standard Epson dot-matrix compatible printer, Atari or HP LaserJet laser printer, all Postscript-compatible printers and the NEC P6/P7 printer. Publisher works on a 520, 1040 and Mega system, with color and monochrome monitor support. The program should be on the market at the end of summer '88. If you haven't noticed already, most of the desktop-publishing packages for the ST include graphics import capabilities from Easy Draw. 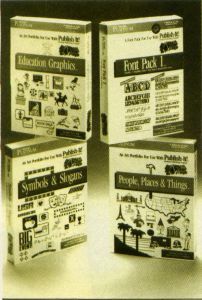 Migraph was one of the first companies to support GDOS, Atari's graphics operating system that lets ST users print fonts and graphics on an ST's screen or to a compatible graphics printer. GDOS can import graphics from a standard GEM image file; so Migraph has found an entire market of people with GDOS-compatible programs who want graphic images that can be used in newsletters, forms and other artwork. The Migraph Scanner / Printer (expected to be less than $1,000 list) looks like a photocopier. Original documents, photographs and graphics are placed inside the Scanner. The pictures are converted into a GEM image file which can be loaded into any of the desktop-publishing programs or into Migraph's Supercharged Easy Draw ($149.95 list). The scanner has a bidirectional Centronics parallel interface, so it can be easily plugged into the printer port of your ST. It takes ten seconds to scan an image, and the software included with the Scanner allows for hatching patterns, gray-scale contrast control, and image sensitivity. The scanner also includes a thermal printer which can be used to print GEM image files. The printer can print 200 dots per inch, which is good enough for most applications. The unit weighs about 22 pounds and is very quiet; so it should be good for small businesses with limited office space. Migraph expects to be shipping the Scanner/Plotter later this year. They are also working on a Facsimile (FAX) system that would use the Scanner and an ST to send and receive FAXs. If all this turns out to be true, they will beat most FAX company equipment prices by at least $500 to $1,000. ($49.95 list), a collection of images scanned with their Scanner/Plotter that can be used with any of the desktop-publishing systems for the ST and IBM PC. Inside the Scan Art box you will find ($49.95 list), a collection of images scanned with their Scanner/Plotter that can be used with any of the desktop-publishing systems for the ST and IBM PC. Inside the Scan Art box you will find an ST disk and an IBM PC disk. Migraph will also be releasing Draw-Art Professional ($59.95 list), a compilation of GEM drawings for Easy Draw 23. The other 68000-based microcomputers have built their new operating systems around multitasking environments. A typical multitasking case lets you run a word processor at the same time a telecommunications program is downloading a file. Since the operating system supports multitasking, programs for the Mac and Amiga can be run at the same time. The ST's GEM system doesn't support multitasking; however, several programs have been popping up that let you run more than one program in your ST's memory at once. Michtroris Juggler ($49.95 list) lets you load up to seven GEMbased programs into your ST. Each application is loaded into a certain portion of memory, then a switch box allows you to select which application will be the "live" program. The ability to switch instantly between applications can greatly improve your productivity. Michtron just released its new Juggler II, an improved version which lets you partition your ST's memory into two, four or eight sections. The new software handles TOS and non-GEM applications too! Now you can switch between a video game and word processor, quicker than your boss can catch you. Intersect Software's Revolver ($49.95 list) is another program that, among other things, switches between various applications. Revolver can save a copy of the entire one megabyte of memory in your 1040 ST to a compressed disk file. At a later time, you can reload the disk file data into your ST's memory and begin running the program where you left off. Revolver is a TOS application that is put into the AUTO folder of your boot disk. When you turn on your ST computer, Revolver loads itself into your ST's memory and waits for the user to activate its main menu. Revolver can be accessed in any screen resolution and within any program, GEM or non-GEM. Therefore, you could save a video game during a difficult game-playing section, and later reload the section to replay the fun parts. Revolver is also an incredible utility for your ST. In addition to its application switching functions, it has an impressive list of disk utilities, printer spoolers, reset-button-proof RAM disks, automatic backup utilities and other functions for which you might otherwise depend on a desk accessory. Neotron Engineering, the makers of Word Up, a GEM word processor for the ST, is now Neocept Inc. It seems that the name Neotron was taken when they tried to incorporate earlier this year. Mike Fulton, senior programmer at Neocept, demonstrated his new program Fontz, a GEM font-generating program which can import font files from the Macintosh and Amiga computers, and from Hippoword and DEGAS. Fontz ($34.95 list) comes with six typefaces in a variety of sizes. The typefaces are GDOS font files that can be used with any GDOS application (e.g., Word Up, DEGAS Elite, etc. ), Fontz will also scale fonts to practically any size or the resolution of an output device, such as a printer or video screen. The program scales fonts mathematically, so a certain amount of "clean up" is needed once a font has been scaled up. To clean up a font, Fontz includes a handy font editor which is completly mouse-driven, so it is easy to use. Word Up ($79.95 list) is a "What You See Is What You Get" (WYSIWYG) word processor for the ST that uses Atari's GDOS to display fonts on the screen and eventually print them on your Epson compatible printer. Included with Word UP are clones of some standard fonts: Swiss (Helvetica), Dutch (Times Roman), Typewriter (Courier.) You can import graphics from DEGAS Elite, Neochrome and other GDOS applications (e.g., Easy Draw and Clip Art.) Word Up also supports the Star NB-series, Citizen Tribute 224, Atari SMM804 9-pin dot matrix, HP LaserJet and Atari SLM804 laser printer. Word Up is a big package for the price. Shelby Moore and Mike Fulton wrote Word Up over almost a two-year period. Moore wrote most of the main program, with Fulton writing the Mail Merge, Glossary, Font Selector and other parts of the package. The program has gone through the typical revisions you would expect of the first release of a program. The current release is Version 1.0 (4/21/88). Neocept offers free customer support for users of Word Up and Fontz for the first 60 days of ownership. A $25-per-year customer-support charge is due for additional support. A new version of Circuit Maker ($79.95), a simulation program that constructs and tests digital circuits, has been released from Iliad Software. The new version fixes several minor bugs, adds Macro capabilities and supports more printers and output devices. Iliad Software began as a group of engineers who bought their ST computers from Lloyd's computers in Orem, Utah. They started a micro-software business through Lloyd's and built a good line of products directed at the CAD/CAM market. Recently, the engineers bought Lloyd out and moved their thriving software and hardware business to a larger office outside of the shopping mall in which Lloyd's was located. Athena II ($99.95 list) is their current CAD package. It supports a large number of functions and is very competitive with Drafix 1 ($195 list, Foresight Resources), First CADD ($49.95 list, Generic Software) and GFA Draft Plus ($99.95 list, Michtron). Iliad also markets Teacher's Pet ($49.95 list) for teachers to track their student's grades on the ST. The system works much like a spreadsheet. Iliad is now shipping image libraries for Athena II. Electronics 1 ($29.95 list) contains commonly used electronics design symbols, while Archetecture 1 ($29.95 list) is filled with CAD symbols and building images. Rumors about adding a 68881 math chip to the ST have been roaming the rumor mills for the past year. At COMDEX we found not one company with an add-on kit, but two! Xetec makes the XCEL card for the ST. XCEL supports the IEEE 32- and 64-bit data types and comes with a library of routines for Megamax C to gain full access to the floating point processor. Other compilers will be supported in the near future. XCEL plugs into the cartridge port on any ST or Mega system so it doesn't require special installation. Weide Elektronik is a West German company that makes a 68881 math coprocessor add-on board for the ST. The board fits inside a 520 or 1040 case; so it must be installed by a dealer or technical person. The software library that comes with the add-on supports Megamax C, Mark Williams C, DRI C, Lattice C, Prospero, Fortran 77, Module II and CCD Pascal. Michtron supplied ST-Log with a copy of the Weide board, so they will most likely market it domestically. Both cards are extremely useful for engineering (CAD/CAM) and scientific programming. They typically yield speed improvements to a factor of 900. Costs range from $300 to $400 and include both hardware and software. 68000er is a big magazine, with as many as 40 people working in its editorial offices. Brandl told ST-Log about some of the new inventions and products he has seen for the ST in Germany, some of which were developed by his editorial staff. "We have sent a new version of GDOS to Atari in Sunnyvale," said Brandl. "The new system was written by Arnd Beissner, who works for us. He is only 18 years old and wrote his own GDOS after seeing the many problems with Atari's version." Brandl wanted this new version of GDOS to be accepted by Atari Corp.; so they sent a package to Shiraz Shivji, the senior engineer at Atari in Sunnyvale. They are currently evaluating the new software. Brandl hopes that Atari will distribute the new GDOS as a replacement to the old system. "I am suprised by the missing products at COMDEX," Brandl said. "At the CeBit (Hannover) fair the Atari booth had many more new products on display. For example, we now have in Germany an MS-DOS Emulator for the ST that was shown." The MS-DOS Emulator was shown as a prototype at the CeBit show and it uses the NEC-V30 processor, the equivalent of an Intel 8086. The card has one megabyte of RAM and a socket for a compatible math coprocessor. The MS-DOS Emulator runs at 10 Mhz, so it should be much quicker than using Avant Garde's PC-Ditto, a software MS-DOS emulator. The price in Germany is DM600, about $300. "We also have Borland's Turbo C compiler in Germany," Brandl commented "It was developed by a a couple of programmers who contacted Borland directly to see if they could use Borland's compiler-parser source code." Borland is also licensing some of its other products to German software developers because they see a strong market in Europe for ST products. Borland's Turbo Assembler will be released for the ST later this year. Strange Systems, a new company from Huston, Texas, has entered the ST market with two new hardware add-on products for the ST. ST Accelerator ($249 list, available spring '88) is an add-on card that replaces your ST's 68000 CPU with a 68000-16 CPU. The new CPU runs your ST at 16 Mhz, twice its normal speed; so any processing intensive application is improved by as much as a twofold speed increase. The ST Accelerator is hardwired into your ST, so it requires a technician to install the board. Because all programs work at 16 Mhz, the board has a button which can disable the Accelerator at any time. Strange Systems expected to show a working prototype of the Accelerator; however, on their way to the COMDEX show in Atlanta, Strange System's car was broken into and stolen. Its only prototype was in the trunk of the car and has since not been found. At the company's hotel suite in Atlanta, the members showed a quickly made breadboard version of the turbo board. Attention all cars: A dragnet has been initiated. Strange Systems has also announced the ST Expander ($200 list, available summer '88). Long ago, a rumor of an expansion box for the ST floated from Atari's corridors onto the pages of many magazines. Like most vaporware, it never surfaced. Strange is working on a box that fits behind your ST and provides for eight expansion cards to be plugged into the bus of your ST. ST Expander comes with a heavy-duty power supply, cooling fan and Blitter socket. Its sturdy metal case makes an ideal monitor stand, as the electronics inside are RF protected. Strange Systems will shortly be releasing the bus information on the ST Expander and is providing developers with additional support and information. Strange is also considering adding an external IBM-style keyboard to the ST Expander for an extra $100. Supra is now shipping a newly redesigned harddisk drive controller which includes output to SCSI hard disks and DMA devices (such as the Atari hard disk or Atari Laser Printer). The new controller also has a battery-powered clock to reset your ST's internal clock whenever you turn on your computer. Upgrading your existing Supra controller will cost approximately $125. Supra Corp. told ST-Log that it was now shipping the FD10 ($895 list), a 10-megabyte removable floppy-disk drive that runs about as fast as a normal hard disk. With the FD10 you can change disks—impossible for a hard disk—so backing up your information is easy. Supra has also begun shipping a 45-megabyte hard disk that fits inside a Mega ST. The unit costs $1,095 list and has to be installed by Supra dealers. One island of the Atari booth was devoted to music products, and while the display was impressive, it would make more sense to lower the concentrated noise level by spreading the music around the booth for future shows. All of the companies showing music composition, editing and recording software had new versions of their products—the ST music market is alive and vital. Hybrid Arts showed their ADAP rack, which records sound digitally and reproduces it exactly. Frank Foster, president of Hybrid, was on hand to demonstrate CZ-Android, a MIDI-patch program which can also store, playback and edit music. Foster told ST-Log about Disney Studio's use of several 1040 ST computers to clean up the sound tracks of several old Disney cartoons. [Ed. Note -A full story of this interesting application of the ST is upcoming]. Dr. T's Music Software has released the new Copyist VIA a score editing program with transcription capabilities for the ST. 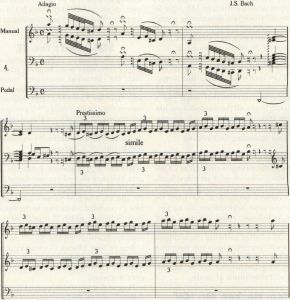 The Copyist program loads music files from Dr. T's Music Recording System (MRS) and prints a complete score on a laser printer or dot-matrix graphics printer. The results are publishing-quality scored music. 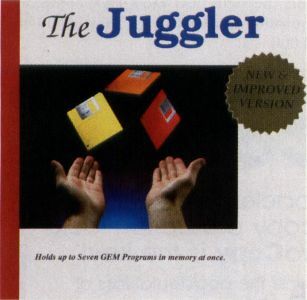 "What we have developed is something better than Juggler," said A.L. Hospers Jr., VP of Dr. T's. "All of our music programs share information." Dr. T's has developed a multiple program environment (MPE) where all of its music recording, scoring and sequencing systems can reside in your ST's memory at once. Merging data from one program to another is simple and straightforward. Passport Designs demonstrated their new Master Tracks Jr. ($129.95 list) music recording system. A low-cost personal MIDI-compatible recording studio, Master Tracks Jr. provides the tools for composing recording and editing music, using an easy-to-learn GEM interface. Once you get comfortable with Master Tracks Jr., you can upgrade to Master Tracks Professional, a more complete version which is suitable for professional musicians. Sonus showed its line of high-end music software for the ST: MasterPiece ($375 list) is a music sequencing system that lets you control sequences of up to 32 tracks at a time, SuperScore ($299 list) is a desktop-publishing system that produces complete, scored music and SST Super Sequencer ($149.95) is a sequencing system for the 520/1040ST, featuring dual MIDI ports, real and step recording and 18 sequences of 24 tracks of playback. MIDIsoft demonstrated MIDIsoft Studio (standard edition $99 list, avanced edition $149 list) which works like a multitrack tape recorder with 32 tracks. Rather than controls that work like a drum machine's, all the controls look like a tape recorder: fast forward, reverse, record, play, etc. The program supports real-time recording and editing. One of the strangest displays at COMDEX was a video-display terminal from Datapoint Systems sporting a built-in video camera pointed at the user. So while you type information on its keyboard, a full-size, color screen of your face stares blankly back at you. The new terminal is billed as being the ultimate "check-up" system, where the operator can check himself to make sure he isn't taking long lunches or coffee breaks. What will they think of next? ICD recently took over the OSS line of 8-bit and ST products. At their first COMDEX with the OSS products, Tom Harker, President of ICD, showed ST-Log the new packaging for Personal Pascal ($99.95 list). Currently, Personal Pascal becomes the third Pascal compiler for the ST, after Alice and Prospero. Personal Pascal is a sophisticated Pascal development system originally developed at OSS that includes full support of GEM, mouse controls, windows, and alert and dialog boxes. It complies with the international standard (ISO) for Pascal and is extended with the GEM library of function calls. Except for very minor changes in the manual, the ICD marketed version of Personal Pascal is the same as the OSS version. The package comes with a compiler, linker, editor and library. The compiler is a fast single-pass system that runs on any ST and Mega computer. ICD continues to market the FA*ST Hard Disk Drive ($699 to $1,700 list depending on storage capacity). The drive fits under an Atari monitor and plugs into your ST's DMA (Hard Disk) jack, providing another DMA output jack at the hard disk for daisy chaining to other hard disks or the Atari laser printer. "Sparta DOS X is currently in beta testing and should be out in early summer," explained Harker about ICD's new cartridge-based disk-operating system for the Atari XE/XL computer. The Structured Query Language (SQL) continues to make great inroads into the personal computer market, mostly due to IBM's announcement last year that the Extended OS/2 operating system for the new IBM PS/2 computer system would include an SQL database. Upon IBM's announcement all of the database software companies announced compatible SQL products. Regent Base is the only ST product that offers the SQL database language. Regent Software showed the new Regent Base 2 ($150 list), 4GL SQL database system for the ST. The new version adds many new procedural commands to the Regent Base langauge which is rapdily becomming a favorite among developers of custom applications on the ST.
Regent Base 1.0 and 1.1 owners can upgrade to Regent Base 2 by buying a $50 upgrade kit available directly from Regent Software. Regent Software also showed the SQL Database Add-On for LDW BASIC Compiler ($30 list), which adds the SQL command set to LDW's BASIC language for the ST. If you are planning to write an application program using BASIC that must keep track of large amounts of data, Regent's new product gives you all the database query and manipulation commands you will need. C has become the favored development language on the ST computer. BASIC, Pascal, and Modula 2 follow as leading development languages. Several products surfaced at COMDEX that show the advanced nature of these markets. Aztec Manx Software introduced its new C compiler for the ST, Aztec C ($199.95 list). The Aztec compiler is said to generate compiled programs which are 40% smaller than the same program compiled using Megamax C. Macros can be used to change the development environment, and once created macros can be saved for later use. Aztec C Express is a turbo version that is reported to be very fast and will be available later this year. Manx is also marketing a Source Level Debugger (SLD) for the ST at a low price of $75. The SLD lets developers set breakpoints, single-step by source-code lines, evaluate and print any C expression, evaluate assembly-language calls and debug desk accessories. Aztec also makes compatible C development systems for the Amiga, IBM PC and Macintosh. Cross development is supposed to be easy as the developer uses the same environment across all of the computers. Michtron announced it will shortly ship the Version 3 of GFA BASIC ($99.95 list) for the ST. The original version was released in June '86 and received good reviews, and currently 50,000 copies of GFA BASIC have been sold worldwide. The new version includes over 300 new commands and an enormous increase in speed, though GFA BASIC 3 remains compatible with older versions. The new editor allows you to hide procedures and see line numbers. All AES functions, Line-A calls, joystick commands and integer operations have been included in the new system. Michtron has also begun a book publishing division headed by George Miller, who was previously the editor of Compute's Atari ST magazine. Michtron has published Miller's first ST books The GFA BASIC Programmers Reference Guide, Vol. I ($29.95 list) and GFA BASIC Training ReBoot Camp ($19.95 list). Both books are suppliments for GFA BASIC. John Demarr showed QMI's new ST Talk Professional ($39.95 list) which is being sold in beta test form until the finished version is out. Abacus is now shipping GFA Basic Quick Program Reference Guide ($19.95 list) for GFA BASIC owners. Robtek is now shipping Skyplot ($99.95) an Astronomy program, Home Publisher ($39.95) a low-end desktop-publishing package that supports 24-pin printers, and Dizzy Wizard ($19.95 list) a "Marble Madness" style game. Michtron showed Omnicard, an ST clone of Hyper-card for the Mac. Atari Germany will be producing another Atari Fair in September as a follow-up to last year's fair which had 20,000 attendees. Electronics Arts is still in the ST software business, but didn't have anyone demonstrating their products even though Atari had a booth set up for them. Niel Harris reported that Flu Shot 3, a free anti-virus program available on DELPHI, GEnie and CompuServe, has been virused. So, be certain to use a more recent version. For the past year Atari has been showing a prototype of an accessory box for your ST that will read recorded information from a compact disc. The unit is called a CD-ROM, and prerecorded information is available from companies who might have previously sold you an encyclopedia, dictionary, thesaurus or database library. The Atari CD-ROM unit looks and functions just like run-of-the-mill compact disc player. A compact disc is loaded into the machine, and the Play button is pressed. Once active, your ST can query the CD-ROM for any information stored on the disc. The data can be text or graphics, and lots of it. A typical compact disc can hold the entire Webster's encyclopedia and Roget's thesaurus. CD-ROM is an offshoot from the laser disc technology developed for the recording and entertainment industry. Laser discs encode information as minute impressions in a clear plastic disc, then a laser beam is used to read the recorded information. CD-ROM has already made inroads into libraries. A listing of all of the magazine articles published since 1982 is available on a CD-ROM from IAC Systems, called INFO-TRAC: An IBM PC/AT communicates with a Pioneer laser disc player to find magazine information. Suppose you want to find the most recent articles about CD-ROM. Typing "CD-ROM" on the PC's keyboard would cause names of appropriate articles and the magazines they were published in to appear. With this information, you can find the periodical containing the article. The amazing thing about the INFO-TRAC is its lightning-fast retrieval speed, thanks to laser disc technology. CD-ROM units come in several varieties; some can find text and graphics, others can also handle recorded video and high-fidelity sound. Although the Atari CD-ROM unit will only communicate text and graphics with your ST, the machine can also be used as a CD Player to listen to prerecorded music. A new development in the CD-ROM field is Compact Disc Video (CDV), in which recorded video and sound can be played back. Cinemaware, a popular producer of entertainment titles for the Atari and Amiga computers, has begun working on an interactive CDV system with Disney and Magnavox. The system will be based on the planned Magnavox CDV player, using Cinemaware's operating software. Disney is involved to provide its resources and input for the planned system, and one of the ideas on the drawing board is to create an interactive game based on Disney's popular Duck Tails television series that is now on the air. CD-ROM and CDV applications are much more difficult to develop than the average computer application. Writing an interactive game requires the talents of good programmers, graphic artists, cartoon producers, talent coordinators, consultants during the development of the CD-ROM and a company which can bring all of these resources together. Disney has already produced a CDV system that has been in operation since September 1985, when the EPCOT Center facility opened its doors for the first time at the Magic Kingdom in Florida. Throughout the new park, guests may use the World Key system to find information about the park. The system uses a microcomputer, Sony LDP 2000 laser disc player, and a Sony Trinitron monitor with a special "touch-screen" interface. World Key users first see a map of the entire park. If the user touches the screen over one of the park's pavilions, a prerecorded one minute overview of the pavilion is shown. The show can include animation, special effects, sound effects and other interesting video animation to show the user the detailed points of interest in the pavilion. "When the World Key screen is pressed, the computer compares where the user's finger is to the graphic being displayed from the laser disc player," said John Kemp, general manager of Automation/Computer for Walt Disney World. "The laser disc player is then instructed to play a recorded video message, then wait for another screen press." Originally, Disney used two Sony LDP 1000 laser disc players, because the access speed to play a video message took too long between messages. Disney used the World Key system to pioneer some of the technology needed to develop interactive video disc systems. In 1985 the technology was very new, but in 1988 it has become commonplace. Arriving at Atlanta airport for the COMDEX '88 trade show, we found a kiosk of touch-screen information terminals describing all the available hotels, car rentals and restaurants in and around Atlanta. By touching the screen a picture of the hotel appears; the system can also place a free call to the hotel for reservations or check-in information. Disney is now working on advancing this technology into areas of EPCOT that were previously based on hard disks and audiotape for information retrieval. Within EPCOT at any point in time, a dozen or more live shows will be taking place using hydraulics, light shows, servo controllers and other special effects. "The EPCOT system currently uses an audiotape of the pavilion show to drive a VAX 1150 main-frame computer. The VAX looks up the event on one of its 100-megabyte hard disks and sends the event information through a simple network to the pavilion," explains Kemp. "In the pavilion is a show controller which translates the event into a digital or analog signal which can control one of the thousands of devices that go into one of our shows. "We've been looking into changing the system to use microcomputers, instead of the VAX mainframes. We went with the VAX systems because the research and development time before EPCOT opened was very short," Kemp said. Microcomputers are perfectly suited for the day-to-day task of looking up data and transmitting it over a small network. The techology of laser discs could easily be used at EPCOT center. 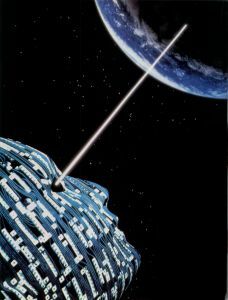 Laser discs with the audio portion of a show could be recorded. A CDV would also hold the event information for each show, then a micro would be used to coordinate the show information and the network. This application would be both reliable and inexpensive. Kemp told us Disney estimates the new microcomputer-based system to be installed within the next 18 months. Although many systems are currently being evaluated, Kemp didn't rule out a 68000-based machine to do the job. A LOOK INTO THE MAIN COMPUTER ROOM AT WALT DISNEY WORLD EPCOT CENTER. 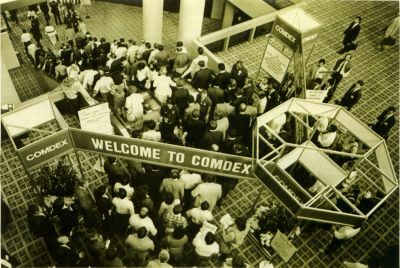 The COMDEX show has many incarnations: Winter in Las Vegas, Spring in Atlanta, Summer in the Orient. The Atlanta show usually doesn't draw as many attendees as some of the other shows—the attendance in Atlanta was only 55,000 people. Among the hustle and bustle of the show, many faces, old and new, were seen comming in and out of the Atari industry. Computer Software Service (CSS) is the largest distributor of software for the ST computer. CSS was run by Bob Schurit, V.P. Sales, and Roger Young, V.P. Marketing. Both men were rather flamboyant and gave a certain "fun" feeling to the risky venture of selling consumer software. Under Young and Schurit, CSS grew tremendously. They tripled their office space and bought out Apex Distributors, another strong Atari distributor. Both men have now left CSS. The new general manager is Paul Davidson, who was previously vice president/general manager at CSS's parent company Chas Levy Company. Richard Frick has left Atari. Frick was one of the original "good-guys" at Atari when he worked on 8-bit Atari products before the Tramiel's bought the company. Like most Atari employees, Frick was bounced around the company doing various jobs mostly related to the ST. Early this year Frick was moved to Mike Katz' office. Katz (formerly of Epyx) is the V.P. of Consumer Electronics, which means games. Apparently, Frick didn't like the new assignment as he quit shortly after. We wish him well in his new position at Tengen. George Miller has moved to Michtron Software from Compute! Publications. Miller left his editing position at Compute's ST magazine to become the Director of Support at Michtron. Since joining Michtron, Miller has founded Michtron's book division. The GFA Basic Training Reboot Camp ($19.95, Michtron) which was written by Miller is the company's first offering from the new division. Joining the ranks of Commodore, Ken Weber brings his 21 years of marketing experience at IBM to his new position as vice president of sales. Ken is already praising the virtues of the Amiga and predicting a 60% increase in the Commodore market. Jack Duree, publisher of the Atari Journal, a small monthly magazine devoted to the ST, has decided to get out of the ST industry. The Atari Journal will become Pages, a newsletter for people involved with desktop publishing. The newsletter will be published under the new company name of Laser Graf publishing and will at first cover ST products and eventually broaden to include IBM PC and Macintosh software. While people were milling about the Atari booth, gazing with wonder over the new software being shown and the new hardware add-ons on display, several parts of the Atari booth were empty and otherwise deserted. One minibooth displayed the announced, but not shipped, Atari PC MS-DOS machine. Atari announced their IBM PC compatible unit at last year's Summer Consumer Electronics Show (CES, as covered in ST-Log.) The new machine received little fanfare, with Atari being more apologetic than enthusiastic about its new product offering. 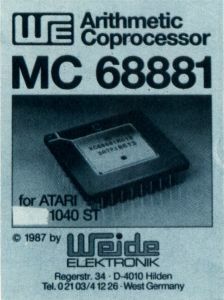 The Atari PC is equipped with a 80286 CPU and has four slots for expansion cards. There it sat, in the Atari booth, with no one looking on. Another booth that seemed to repell onlookers was the Microsoft Write display. Microsoft Write was first announced in 1986, when the ST market was hot for a multifont word processor that could also handle graphics like Microsoft Word for the Macintosh. MS Write is a port of Microsoft Word 1.05 for the Macintosh. As a typical program which relies on GDOS—the utility software which allows GEM to display and print fonts and graphics—MS Write for the Atari received little fanfare when it finally hit the market two years after its impending announcement. 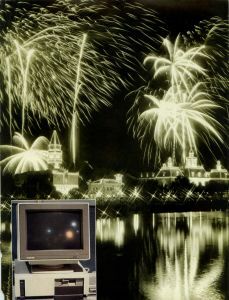 The other exhibits at the Atari booth were well attended with excited visitors who got a chance to see the next wave of software for the ST.
EPCOT CENTER'S NEW MIGHTY SPECTACLE "ILLUMINATIONS." THE NEW ATARI IBM PC COMPATIBLE UNIT WAS INTRODUCEO AT LAST YEAR'S SHOW. With the slow pace of.get-togethers, it's. best to prepare by composing your questions ahead of time in your terminal software's capture buffer or by saving them to disk for quick call-up when (he moderator tells you it's your turn to go.